Émile Zola was born on this date in 1840. 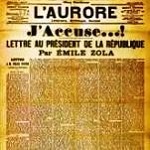 He published a front-page defense of the wrongly convicted Alfred Dreyfus, J’Accuse…!, and was himself convicted for doing so. Writing prompt: Write a scene in which your protagonist risks his/her livelihood to defend a person your protag is convinced is innocent.